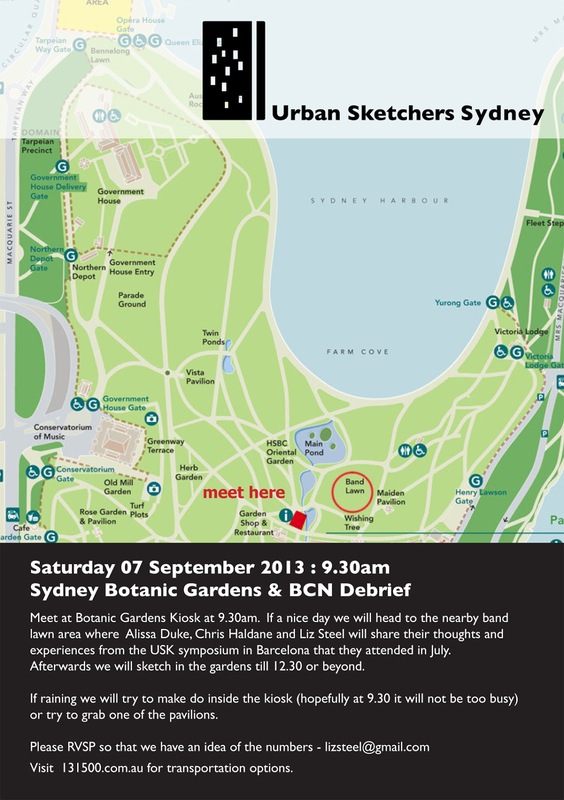 Urban Sketchers Australia: USK SYD 7 September - BCN Debrief! USK SYD 7 September - BCN Debrief! This month we will combine our usual sketching event with an informal 'debrief' from the three of us that attended this year's International USK Symposium in Barcelona. We will give a brief run through the workshops we attended, what tips we picked up and some general comments…in short it was amazing!!!! Meet at Botanic Gardens Kiosk at 9.30am. If a nice day we will head to the nearby band lawn area where Alissa Duke, Chris Haldane and Liz Steel will share their thoughts and experiences from the USK symposium in Barcelona that they attended in July. Afterwards we will sketch in the gardens till 12.30 or beyond. If raining we will try to make do inside the kiosk (hopefully at 9.30 it will not be too busy) or try to grab one of the pavilions. Please RSVP if you plan to attend so we have an idea of numbers. And yes, I know it is election day so don't forget to vote before or after!